The last time I read a non-china mieville book that won as many awards as Jo Walton’s Among Others was Paolo Bacigalupi’s Wind-up Girl which ended its course winning more awards than Among Others’ current tally. That’s probably as much as you can speak about the two in the same breath – as Among Others was (imho) as much a pleasure to read as Wind-up Girl was underwhelming. 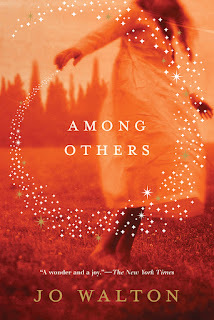 ong Others is an ode to classic SF (and fandom) and the love of books, as it a fabulous bildungsroman (I am a sucker for those). The first person epistolary narrative style just adds to the charm of this book. Now, is this narrator – a 16 year old girl who's just lost her twin, sees fairies, does magic, creates a karass all her own, and is running away from her evil (witch) mother – an unreliable narrator or not? Could go both ways depending on who is reading. When I first heard about the book it was posited as an anti-thesis to Harry Potter because the protagonist was a girl who knew magic and went to a regular, non-magic boarding school. But Among Others turned out to be so much more. Magic is what you make of it; the closest the ‘magic’ in this book comes to is perhaps the ‘magic’ in Bridge to Terabithia. So in that sense, it is only ‘science fiction’ if you want it to be, and ‘fantasy’ if you say so.